These waders are well respected throughout the UK. Commonly worn by anglers, nature enthusiasts and workers in wet and muddy conditions. 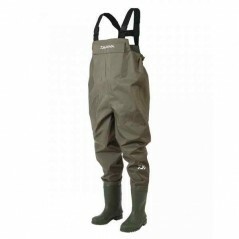 These are considered one of the most reliable and hard wearing waders on the market due to their 700g PVC coating and comfortable soft polyester interior. They feature extra wide 'high frequency welded' seams to ensure reliability under the most extreme conditions ensuring the seams stay sealed when others would break apart. Fabric has a slight stretch for comfort. We stock these in Studded and Non-Studded versions. Safety version offering safety boot (steel mid sole and toe cap) conforms to S5 and EN345-5 also available by email special order. Please contact us for more information and prices.